We welcome volunteer gardeners and docents. 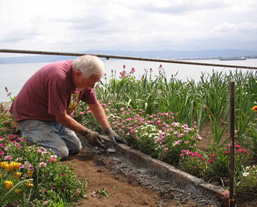 Volunteer gardeners work on the island every Wednesday and Friday morning from 8:30 to 12:30 to weed, prune, and plant. To sign up, click here. 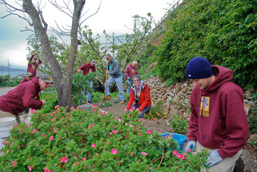 Our volunteer program began in 2003 when the gardens were completely overgrown and since that time volunteers have donated thousands of hours to rebuild the gardens of Alcatraz. Group volunteer days are also available. 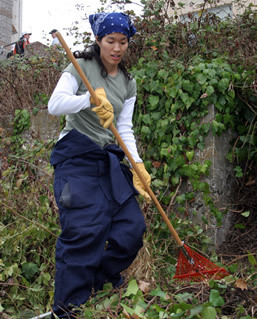 To set up a group volunteer workday, email volunteer@parksconservancy.org or call (415) 561-3077. Work groups have made a tremendous contribution to the garden project. For a list of recent volunteer groups, click here. If you are interested in becoming an Alcatraz Historic Gardens docent, please fill out an application. Docents lead visitors through the gardens for up to an hour and/or engage visitors at a designated stop in the garden. Docents complete a training course and lead tours at least twice a month. Watch a short video about volunteering in the Gardens of Alcatraz. View past issues of the monthly email news sent out to our regular volunteers.